Today we are have a little mental celebration because it's Friday! A special Friday though because this is the Friday that tells us we have one. more. week!!! One more week until Summer!! And we are sooooo Summer ready! I've been counting down this date since last July. That's when our crazy school system goes back to school. I might cry big ugly tears over that fact each year. This week I hit my wall. I am so done. Done to the point that I ordered a pizza last night just so I could have something to put in the lunch boxes. Because among all the 597 school activities going on right now the grocery store just didn't happen, and my kids devoured everything in sight by Wednesday. Don't judge. It was better than the frozen waffles option. But the official countdown is on. One. More. Week!!! Now onto the super fun part - Friday Favorites! I haven't done a Friday Favorites in a while, and I have some super fun finds lately. Amidst all those 597 activities I mentioned I've apparently been stress shopping. So life might be chaotic, and I've resorted to late night food delivery as survival, but at least I look cute. It's not quite summer yet, but here it totally feels like summer. The temps have reached above 90 degrees, the humidity is doing crazy things to my hair, and the kids don't understand why it's still daylight when they have to go to bed. Water guns squirting counts as a bath right? Kidding. Sort of. 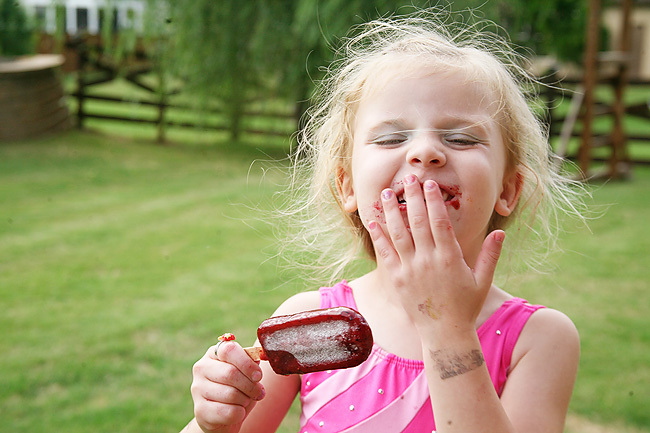 Some are at least healthy popsicles though. So I have that going for me. Summer moments are just my favorite. Since it feels like summer I've also broken out my summer staple - all the seersucker. 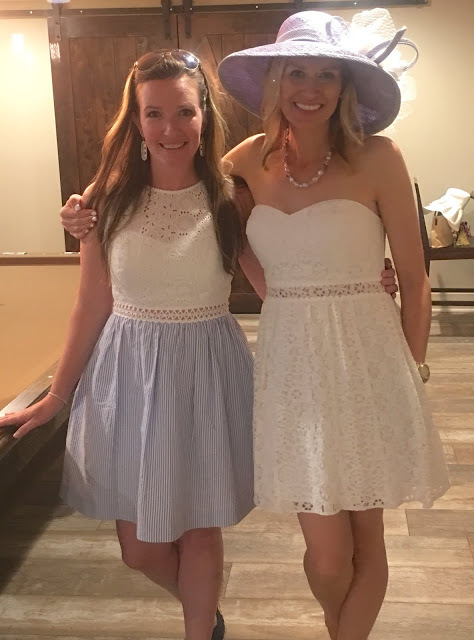 The seersucker dress I wore to Carrie Beth's Derby Party a few weeks ago has been my go-to during awards season too. My favorite part about the dress (besides the fact that it has pockets, and dresses with pockets are awesome!) is the tiny details it has. I love the tiny fringe around the arm openings! Another seersucker favorite on repeat lately is this fun loose fitting tank. I'm in love with the crochet hem. Online it looks a little boxy, but on it fits great. Apparently when I stress shop, shoes just happen to pop themselves in my cart. I have two new pairs of sandals that will be worn all summer long. They are so comfy! First, is this rose gold sandal. Now they look like the Birkenstock pair. They feel like the Birkenstock pair. But they are about half the price. I know Carrie Beth has shared an even cheaper version that she loves (she even named them one of her favorite finds of 2017! ), but I couldn't find them in my size. A neighbor told me about these and they are perfect. I went to try on the Birkenstock counterpart and for some reason most Birkenstocks are really wide on my foot. Or maybe that is just how they feel/look to me?? Call me crazy. But I saw this pair on my neighbor who was kind enough to let me try on hers and it was a perfect fit! I wear a 6.5 and they were TTS for me. Between the two of us we have all three versions - texting her now that we need to do a comparison at some point for you guys! The second pair of shoes I purchased were these hot pink sandals. I apologize now because you will be seeing a lot of these this summer. They sandals come in a ton of colors, but pink will get me every time. I love how they fit and feel so much I might grab another color or two. I found them slightly on sale here, here, and here. I ordered half a size up based on the reviews and they fit perfect. Did you see the super cute pink tassel earrings above too? Those are also a new favorite! They are so fun, and so light weight. I've gotten tons of compliments on them the few times I've worn them. 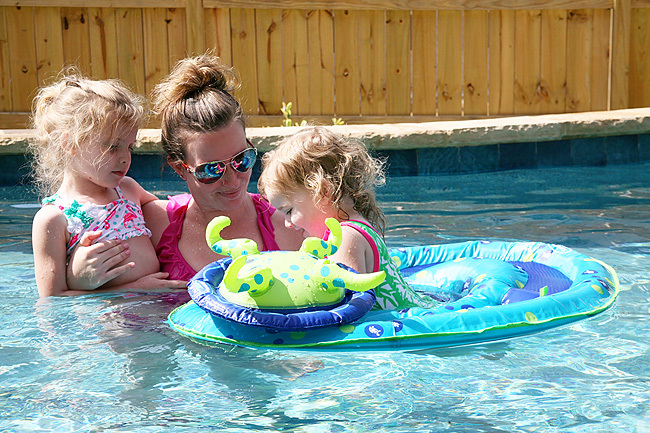 They come in a ton of fun colors and currently have an automatic coupon for 5% off. And since you guys know we are all over the one piece swimsuit trend right now, I might have woken up early to add another one to my poolside line-up for the summer. You know I love me some Lilly Pulitzer, and this morning they released some of their new swimsuit designs to kick off their summer roll out. I am swooning over it all! I put one in my cart and will share the details once I get it, but how cute are all of these?! The whole summer line is actually super cute, and right now they are are doing a huge gifts with purchase promotion. This next favorite will be a year round favorite of mine. Carrie Beth shared this little hair secret with me when I saw how voluminous her hair has been lately. She told me about this root boost and I gave it a whirl. Because as they say here in the South, "The bigger the hair, the closer to God." I love it! I sent her this pic after I did my hair the first time using it, and was so impressed. (Excuse the lack of makeup or clean bathroom. We can't have everything.) If you want a little extra volume in your life, I'd put this on your radar. A little goes a long way, and I'm super impressed with the hold and volume - especially having longer hair. This favorite is for all you fellow Disney lovers. I popped into Target to grab some end of the year school gifts and saw their new Disney line. I am swooning over how cute everything is! Luckily for Mr. Cute (and his Amex) this didn't come out before our trip because their is such super cute attire for the whole family! Carrie Beth just missed it to for her trip this past weekend. It's all so adorable, and I love when some of the Disney stuff is subtle. The Junk Food line is so fun, and I loved the "Living The Dream" tee. There are tons of items for gifts and housewares too. This little sleeveless hooded dress was another one of my favorites. And this tote with the bow slides is to die for. They even had make up from L'Oreal and some super cute nail polish sets. There's a little Disney magic for everyone and everything. Just the way Disney likes it. That wraps up my favorites for the week. Now off to a super fun weekend. We're headed back to The Battery Atlanta to see our favorite baseball team throw up another W - Go Braves! We are so excited!